Every year, hundreds of thousands of kittens end up in animal shelters, in need of permanent homes. But raising orphaned newborns into healthy, fluffy, frisky 2-month-olds ready to be adopted requires an enormous behind-the-scenes effort. All across the country, volunteer foster parents log many sleepless nights bottle-feeding kittens, which are even more helpless than human babies. So researchers and shelters are trying to figure out ways to make it easier. “A lot of people think fostering is taking kittens home and playing with them,” said Penny Dougherty, chief executive director of Kitten Central of Placer County, an animal shelter she runs from her house in Newcastle, California, 30 miles northeast of Sacramento. Kitten Central receives most of its kittens from Placer County Animal Services. Dougherty cares for kittens up to 1 month old, as well as feral and stray cats with litters. After the kittens weigh at least 2 pounds and have been spayed and neutered, she returns them to the agency so they can put them up for adoption. Dougherty said that before she opened Kitten Central in 2012, Placer County Animal Services regularly euthanized newborn kittens, a common practice around the country. The nonprofit covers its expenses through donations and a $62.50 charge to animal services for each kitten it fosters, a fee that covers food, vaccines, heating pads and antibiotics, said Dougherty. When the days start getting longer, around January, cats start breeding. March is the beginning of what’s known among shelters as “kitten season.” The flow of kittens doesn’t slow down until November. For the most part, it’s a human-made problem, she said. People who come across a new litter may think that the mother has abandoned her babies, and they take them to a shelter. But more often than not, the cat is just off looking for food. To steer clear of inundating shelters with newborn kittens, Delany’s advice is to leave litters alone unless they’re in immediate danger. Most of the time their mom will return, she said, so check back periodically. 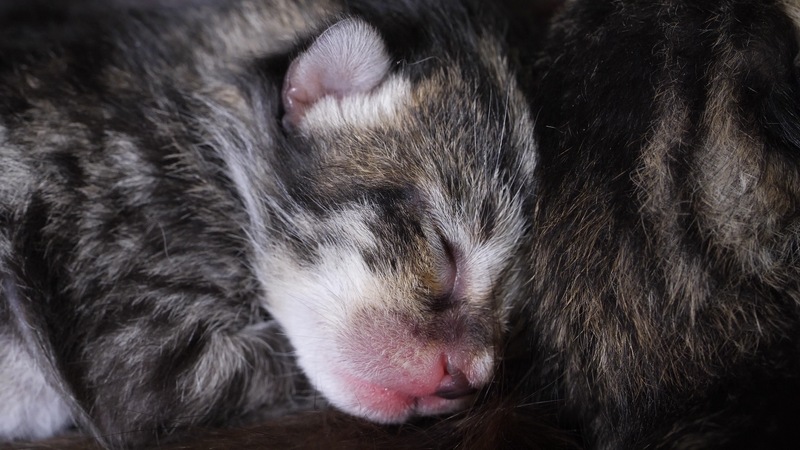 Newborn kittens are particularly vulnerable because they’re born underdeveloped. They’re what’s known as altricial. They need a lot of care from their mothers, in comparison with baby animals such as foals, which stand up within an hour of birth. 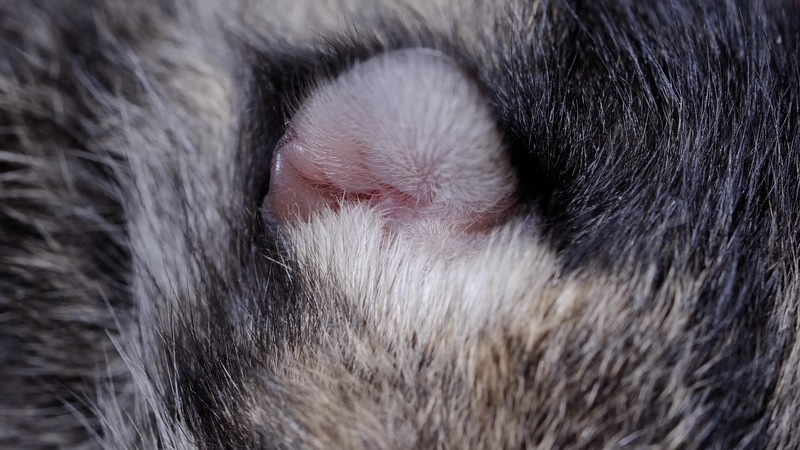 During the first week and a half of their lives, kittens’ eyes are sealed closed and their ears are folded up, making them practically blind and deaf. They don’t stand up until they’re a month old. To survive, they need their mother to keep warm and nurse. They find her milk by sniffing and pawing. When a mama cat is absent, newborn kittens require around-the-clock human care and a heating pad to lie on. During their first two weeks, they need to be bottle-fed every two to three hours throughout the night; and after that, every three to four hours. Newborn kittens can’t even pee on their own. They need their foster parents to lightly rub their backsides in order to be stimulated. This mimics the licking their cat mother would do. So after bottle-feeding a 2-week-old kitten, Dougherty rubs its bottom with a wipe to encourage it to pee. The job becomes even harder when newborn kittens get sick with respiratory diseases or diarrhea, which they often do because their immune systems aren’t developed yet. All this work makes it challenging to find volunteers. “Some of my fosters burn out after three seasons,” said Dougherty. She manages 35 foster parents, who cared for 515 kittens in their houses last year. In an effort to lessen the load on foster parents and increase newborn kittens’ chances of survival, Mikel Maria Delgado, a postdoctoral researcher in the School of Veterinary Medicine at UC Davis, is joining forces with Kitten Central and other animal shelters to figure out if there are optimum temperature and humidity levels that make it possible to feed newborn kittens less frequently. She has distributed incubators to the groups so that two or three kittens can be kept in each one for about three weeks. During their first two to three weeks of life, kittens can’t keep themselves warm on their own and need a constant source of heat, whether their mom, siblings or a heating pad of some sort. Some of the incubators in the study are kept at 90 degrees and others at 80 degrees. 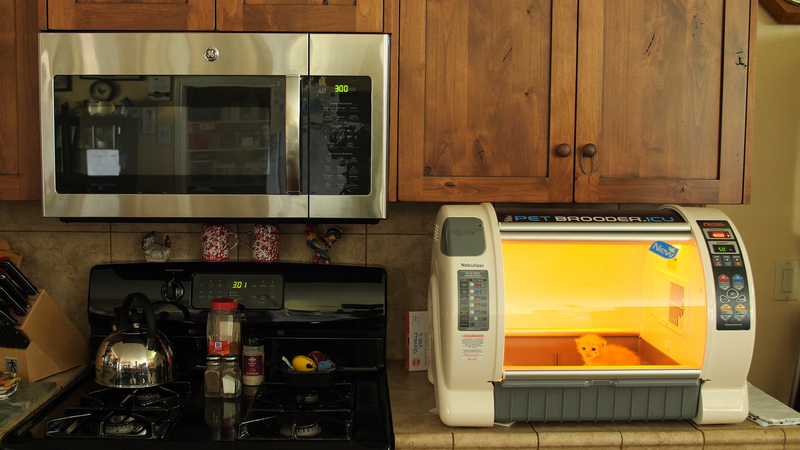 The incubators, which cost $1,000 apiece, look a little like toaster ovens. The kittens sleep on a warming pad inside. In an incubator on Dougherty’s kitchen counter, 2-week-old tabby brothers she calls Winston and Winfield are learning how to play, scooting around on their bellies and tentatively lunging at each other. They were abandoned at birth by a feral cat at a house nearby. As part of the research project, Dougherty weighs them after each feeding and keeps a log of how much they ate. Delgado’s study started in May. She has collected data on 70 newborn kittens fostered by Kitten Central and other groups like the Orphan Kitten Project run by UC Davis veterinary students. She’ll be gathering data next year, too. If it turns out that keeping kittens at a particular temperature and humidity helps, Delgado then plans to design a cheap alternative to an incubator that animal shelters could use. Additional reporting contributed by Emma Hiolski.